Villa Park&apos;s best known building might be the Odeum Expo Center, where — in just a matter of weeks, in fact — you can see "The Greatest Ferret Show on Earth" or experience the largest haunted house in Chicagoland. Take your pick. But here&apos;s something else worth seeing: an iconic and beautifully-maintained BMO Harris bank at St. Charles Road and Villa Ave., designed by a disciple of architect Mies van der Rohe. Indeed, the midcentury bank&apos;s design was inspired by an unbuilt work by Mies. Built in 1964 as Villa Park Bank, the flat-roofed, single-story bank has floor-to-ceiling glass walls and an open floor plan. The building is supported by a pair of exposed trusses running parallel to each other across the roof. A drive-up facility was later added (you can see it to the left of the photo above), borrowing on the same architecture and engineering principles as the main building. The bank is a spectacular piece of modernism, particularly for a could-be-anywhere business strip with the usual run of fast-food places, dollar stores and the like. The bank was designed by architect Peter Roesch, who studied under Mies at IIT in the 1950s. 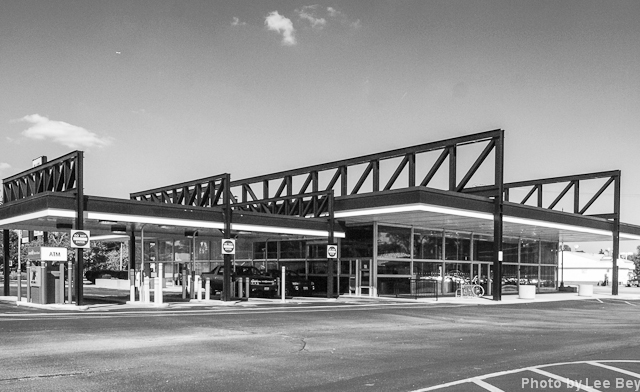 His scheme for the bank was inspired by an unrealized Indianapolis drive-in restaurant Mies designed for theater chain owner Joseph Cantor in 1946. The concepts behind the unbuilt restaurant would manifest in full in 1956 with the completion of Mies&apos; world-famous Crown Hall on the IIT campus. There, four visible overhead steel girders attached to eight steel exterior columns support the structure and create open "universal space" inside the glass-walled structure. Roesch is now 83 and retired. He has vivid memories of designing the bank in Villa Park. "After it was built, they all thought it was a refreshing new idea and that made it something of a landmark in Villa Park," he said. Roesch said the use of trusses was a way to overcome the poor and "trashy" soil conditions on the site. With the building&apos;s weight supported by something akin to a bridge structure that touches the ground in just four points, the expense of drilling numerous caissons through the bad soil was eliminated. 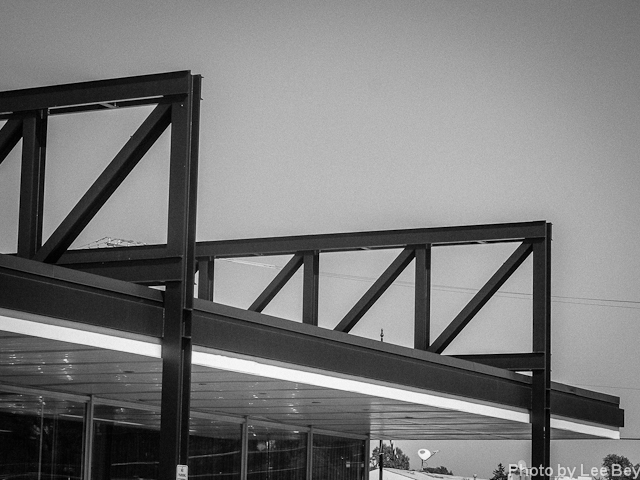 Roesch studied Mies&apos; 1946 restaurant as part of his masters&apos; thesis at IIT and said he was able to improve a bit on the four exterior columns to make the design work better. He also liked the idea of an all-glass bank. "The critics said, &apos;What is that all-glass building?&apos; I said &apos;It is a safe bank. You can see inside.&apos; "
Like Mies, Roesch was born in Germany and was an architect there before moving to the United States. "I am a modernist and a minimalist," he said. "When I got to Mies, my whole life changed. He was the kind of person I thought didn&apos;t exist: He built what he thought. I held on to him and learned from him." Roesch had a long career as an architect and professor at IIT. With his firm Hammond & Roesch in the 1960s, he designed the notable Episcopal Church Center at 65 E. Huron. Mies died in 1969, five years after the Villa Park bank was completed. Did the student ever take the master to see his work? "I never took him there," Roesch said with a hint of regret. "I never knew if he saw it on his own. He was a very busy man — up to the end." Roesch himself hasn&apos;t seen the building in decades. "It&apos;s the same with any good architecture. You have to photograph it the day it was built and keep your fingers crossed," he said. "I hope they didn&apos;t mess it up." One last thing: A look at the unrealized house Mies designed for Joseph Cantor in 1946.